Today, Amazon unleashed a (fame) monster that it seems unable to control. 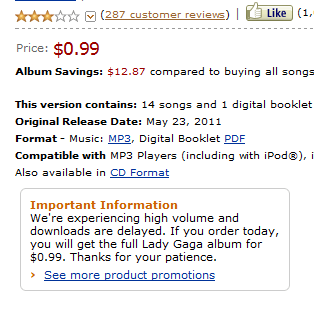 For one day only, Amazon is selling the mp3 version of the new Lady Gaga album (all 14 songs, plus a PDF booklet) for $0.99. The sale seems to have taken the Web by storm, and it’s shown just how fragile Amazon’s download service could be.